What is a floor scale? A floor scale is a type of industrial weighing scale used to weigh heavy, large or oversized objects in kilogram and tonne weight capacities. They typically represent any type of weighing machine that is operated on floor level, including platform scales, pallet scales and pallet beams. Floor scales often are used when other scale varieties, such as bench or counting scales, are not suitable and are frequently found in industrial settings such as warehouses, dockyards and factories. They are highly versatile scales that can be combined with cages, cattle crushes and supports in order to weigh anything from car parts, containers or animals. They are reliable and solidly constructed and are able to withstand punishing warehouse conditions where other scales may become easily damaged. How does a floor scale work? Generally speaking, floor scales work the same way as regular scales. Digital floor scales require users to specify the weighing units — grams, kilograms, tonnes or other custom unit measurements depending on your requirements. If you need to weigh a large number of items, you may need to preset more specific functions, such as checkweighing or parts counting. Due to their larger size, floor scales are best used in open areas where oversized bulky objects can be safely manoeuvred. However, most floor scales are portable and can be stacked and stored with minimal effort. Industrial floor scales are designed specifically for shipping yards, manufacturing plants, factories and other large warehouse environments. Typical floor scales feature high capacities and are ideal for weighing oversized crates and large pallet inventories. Additionally, they offer a variety of checkweighing and parts counting functions that are helpful for stocktaking tasks and inventory control. Versatile and durable, commercial floor scales can handle numerous applications in retail settings. They offer high weighing capacities, along with checkweighing and parts counting functions when combined with checkweighing indicators. This allows businesses to maintain accurate records of available stock, and helps ensure that a standardised product is packed and distributed for commercial sales. Breweries find that approved floor or platform scales are extremely helpful for weighing full beer kegs. In this simple process, the user programs a preset value into the scale, and then measures each keg individually to ensure their weights are within the set range. The parts counting function verifies that each unit contains the correct number of kegs. Workers can stack multiple units on the scale and perform checkweighing to ensure accurate product weight. 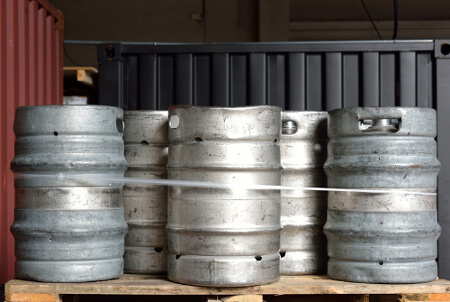 Kegs can then be sold or distributed to pubs and bars without taking time to count all the kegs individually, and with the assurance that each keg contains the correct amount of product. It is important to note that trade approved scales are required when selling products by weight. Often, floor scales are used for veterinary weighing tasks, and can accommodate larger animals – from dogs and livestock, to lions and elephants. Some platform floor scales offer a dynamic weighing function, which is helpful when weighing moving animals. The weight is accurately calculated by averaging several readings recorded at short intervals over a span of time while the animal is on the scale. Pallet beams can be combined with cattle crushes to create highly effective scales for weighing pigs, sheep and cows. Alternatively, large cages or weighing platforms can be placed on top of pallet beams in order to measure zoo animals that are large or that behave erratically, such as giraffes, lions and monkeys. For more information about animal weighing please see our article on how to choose the best farming scale. 1) Is the weighing pan size adequate? One of the first things you should verify is that the floor scale you’re thinking of buying is large enough for your needs. If you are weighing oversized containers or crates, make sure they’ll fit on the pan. 2) Can the scale accommodate the capacity you need? Check to see that the scale has a high-enough capacity to handle the items you intend to weigh. If you plan to weigh multiple items simultaneously, make sure that the total weight doesn’t exceed the scale’s maximum. 3) Does the scale offer the functions and features needed for your applications? It is essential that your scale can perform the appropriate applications for your needs. If you need to count a large number of items, ensure your scale can perform parts counting. Alternatively, if you are a vet or farmer who needs to weigh animals, you should select a floor scale with dynamic weighing capability. 4) Consider the location. Where will you be using the scale? Some floor scales require flat surfaces and large, spacious areas. It’s important to make sure the designated weighing area is free from obstructions, and that it’s and large enough to accommodate not only the scale, but also any containers, crates and cages. 5) Do you need more than one scale? To achieve the best weighing results, it may be worthwhile to invest in multiple weighing machines. Floor scales offer higher capacities and tend to measure in kilogram increments. You might find it beneficial and practical to combine a floor scale with a bench scale that weighs in smaller increments. For example, coffee beans distributors might operate on a smaller commercial level, as well as being part of a larger business supply chain. This means they’ll need the ability to weigh smaller bags for coffee shops, as well as big sacks of beans for distribution to large-scale users, such as coffee chain stores or warehouses. The calibration procedure may differ slightly depending on the type of industrial scale you use and whether your scale has internal or external calibration. Floor scales with higher weight capacities, such as Adam’s PT platform scales, will require higher capacity test weights, such as Kern’s cast iron block test weights for calibration, whilst smaller bench and floor scales such as Adam’s CPWplus will require lower capacity weights, for example, M1 Class test weights. Ensure the scale is placed on a level surface and turn on. Ensure there is nothing on top of the scale and that zero is showing on the display (you will need to zero the scale if this is not shown automatically). Place the scale in calibration mode (this can usually be found in the scale’s user setup or factory menu). Once in calibration mode, you will need to place calibration weights appropriate to the scale’s weight capacity and readability on top of the scale. Note: Larger scales typically have larger weight capacities and readabilities than other types of scale, therefore if the scale’s readability starts at 1g then significantly smaller weights, e.g. small milligram calibration weights, may not be picked up accurately by the scale. Using a set of approved calibration test weights, add each calibration weight individually onto the scale’s weighing pan and check that the weight value on the scale’s display matches the mass of the calibration weight. Once all weights have been checked and are showing correct, you can return to the normal weighing mode. Floor scales should be used when weighing large, heavy or oversized objects in kilogram or tonne capacities. Floor scales have large weighing pans and weighing capacities compared with other scale varieties. Consider how you intend to use the floor scale as well as required features, pan size and surrounding environment before buying a floor scale. 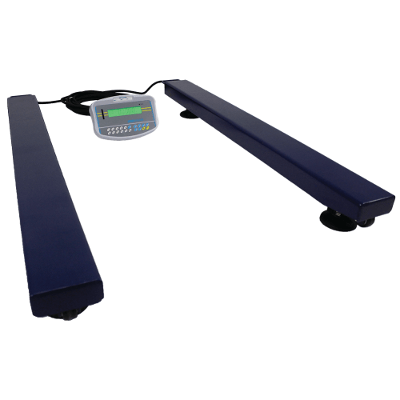 The PT platform scale is a sturdy, heavy-duty, warehouse scale featuring a large weighing area and capacity. Ideal for industrial weighing, the PT works in tandem with a selection of indicators for checkweighing and parts counting applications. Dependable and versatile, AELP pallet beams are practical and portable for multi-purpose weighing. The AELP can be combined with sturdy weighing platforms and cages to securely weigh animals, machinery or stock. Convenient and easy to use, the DE-D platform scale is a reliable, cost-effective commercial scale. The DE-D offers a medium-sized pan that weighs in gram and kilogram increments. The DE-D is is ideal for commercial weighing in smaller increments alongside a PT platform. The CPWplus is one of Adam Equipment's most popular products. This product has a durable steel base and comes in a wide variety of platform sizes that can be used in industrial, retail, vet, medical and food industries. The PTM steel drum and barrel scale comes complete with a large steel weighing platform and accessible ramps for easily moving beer kegs, steel oil drums and barrels onto the weighing platform. Integrated wheels and sturdy handles make this scale fully portable.